The death of a loved one can be hard enough to deal with without the extra worry about the cost of carrying out their wishes. Key decisions — including the executor of the will, whether to die at home or whether you are buried among the trees or cremated — all involve a financial burden and much easier made when family members are not bereaved. Most choices to do with the end of life can be pre-planned and possibly prepaid which can go a long way to help surviving family and friends avoid an extra layer of stress at a time of grief. The reality of the need for family caring is “rising like a wave in a high swell approaching the shoreline”, says CRH Law partner and elder law specialist Brian Herd. It is estimated that 80 per cent of people receiving care and support in the community receive it from family members and other informal carers, such as friends and neighbours, reports the Australian Institute of Health and Welfare. Further, the number of people dying each year will double in the next 25 years from about 150,000 in line with the aging population, according to the Australian Bureau of Statistics. Family members contemplating the caring role should discuss it with others and even document the arrangements so the whole family is on the same page, says Brian Herd. Based on a US study, family caregivers could spend more than $9000 a year of their own money towards their caring role. If you want to be reimbursed for legitimate expenses, put arrangements in place. Other key considerations are the financial impact if you have to quit your job to care for your parents, as well as the impact on your own retirement plans. Retired Palliative care doctor and advocate Yvonne McMaster says most people want to die at home, until reality hits. She says the process of dying is very drawn out which can become very distressing for relatives not knowing if they are doing the right thing for someone at home, which is where palliative care specialists can help. “Palliative care doctor and nurse specialists have expertise in controlling pain, delirium associated with dying and death as well as access to equipment, physiotherapists, social workers and nurses to assist with medication,” says Yvonne McMaster. Palliative care services are employed and paid for by state and territory governments, although the waiting list, how they are accessed and their resourcing varies between jurisdictions. Often it is a case of tapping into the relevant services via a hospital, general practitioner or specialist. Not-for-profit community care group Silver Chain provides specialist home-based palliative care in Western Australia and NSW. The service is fully funded with no out-of-pocket expenses for the client, says Silver Chain Group, chief executive officer, Christopher McGowan. Home care providers and aged care facilities are increasingly advertising that they do palliative care. In most cases, this will mean they are able to provide 24-hour care by experienced registered nurses who completed a course about palliative care. Any medication needed would have to be prescribed by the person’s GP. The decisions around who gets what assets after someone dies is one thing, but equally important is who is appointed to administer the will to ensure it is done appropriately and in accordance with the relevant state or territory law. Depending on the will, the task of an executor can be extremely onerous and potentially costly. This is why it is worth including an independent and trusted person such as an accountant or solicitor, says law firm Cowell Clarke partner Natalie Abela. “The executors may have to pay fees to obtain a grant of probate and other ongoing estate liabilities and costs until estate assets are accessible. The executors must then be reimbursed for payment of those costs out of the estate before any distributions can be made to beneficiaries,” she says. This entitlement to be reimbursed may be helpful to the executor in the long run but it is another reason why careful thought should be given in the beginning about who is appointed. If you appoint someone without the means to cover the necessary expenses upfront – which can run into thousands of dollars – then the whole distribution process will be delayed,” adds Natalie Abela. Natalie Abela suggests appointing at least two people – in case one can’t or doesn’t want to do it – and if you are going to appoint an adult child, then it may be appropriate to appoint all of your children, so that upon your death, they can each decide if they want to take up that role. “It can cause friction when close family members (such as siblings) are not all named as executors and therefore excluded from carrying out the terms of their loved one’s will,” she says. “The role of an executor must not be taken lightly. The complexity of the will and the types of assets in the estate may dictate who a testator appoints as executor. It may be beneficial for the testator to notify the person or persons they have appointed to ensure they are willing to take up that role and properly administer the estate,” says Natalie Abela. DSS Lawyers partner Rebecca Tetlow says that in most cases, the first step for an executor is to place a notice in the local paper or on the relevant Supreme Court’s website advising of the application to have the will validated. This gives anyone believing they are entitled to the assets a chance to come forward. Application is then made to the Supreme Court for grant of probate which is the court’s determination that the will is valid and the assets of the deceased are vested in the name of the executor. The court fee varies by state and depends on the value of the assets. For an estate above $5 million in NSW, for example, the filing fee is $5500. Rebecca Tetlow says once probate is granted, further professional help may be needed to help deal with assets such as the transfer and release of bank account balances or shares. With the exception of the money needed to pay for the deceased’s funeral expenses, all the other assets much stay untouched until probate is granted. Once probate is granted, all liabilities such as tax and the executors costs have to be paid before any distributions are made. By law every person’s estate must provide for a funeral but if you care about the kind of send off you have, then you may not want to leave it to others to decide. The sudden recent death of a friend opened the eyes of Iean Ellery, 67, and his wife Margaret Ellery, 65, to what it meant for the surviving partner to have to unexpectedly plan and pay for a burial site at short notice. “It made us realise we also weren’t prepared and that we hadn’t budgeted for it,” says Iean. The couple toured Enfield Memorial Park in Adelaide where Margaret fell in love with the plans for the new garden, including the planting of the same trees they have at their own home. They have now pre-purchased a burial site where Margaret will be buried and Iean will be cremated and memorialised. “By pre-purchasing our site, as well as our burial and cremation fees, we have peace of mind knowing that our final wishes will be fulfilled. We will be together forever and laid to rest with other family members,” says Iean. “We didn’t want our sons to be responsible for paying and arranging our burial site when we pass away. They don’t need that burden at such an emotional time,” he says. Fergus Kelly, spokesperson for InvoCare’s online service Funeral Planner, says the average cost of a funeral is $6000. Invocare is a listed funeral and crematorium operator. But the final cost will depend on the funeral director’s fees and personal choices around caskets, cremation or burial, church or funeral home, flowers, music and newspaper ads. Basically anything is possible and it may or may not have a cost associated with it. Another way to compare offerings is via online disrupter gatheredhere.com.au, which allows you to compare prices and reviews of funeral homes around the country. Cremation is cheaper than burial — $400-$1000 rather than $4000-$50,000 — depending on the cemetery. For example, if you are buried in a crypt, it costs more to be buried above ground than below ground. Adelaide Cemeteries Authority CEO Robert Pitt says each state and territory runs its crematoriums and cemeteries differently, which can impact on the cost. It may be worth checking how long an internment right lasts before the cemetery re-uses your burial site. In South Australia, for example, an interment right lasts for only 50 years. After that, unless remaining family members arrange otherwise, the grave is shared and the memorial stone removed. Natural or woodland burials are slowly gaining momentum as the most environmentally friendly way to deal with a body — but don’t expect them to be much cheaper than other burial options. The cost of being buried in a shroud or cardboard coffin among the trees in the grounds of a cemetery can still be anywhere from $3000 to $5000 depending on the jurisdiction. Pitt believes in pre-planning and pre-paying for many of the costs such as cemetery fees and caskets. It avoids price rises, ensures the person dying gets what they want and helps the bereaved, he says. The three main options for prepaid funerals are funeral bonds, funeral plans and F.
Funeral bonds are managed investments that earn interest. Most are capital-guaranteed and attract annual management fees of up to 3 per cent. An initial investment of say, $500, is followed by regular contributions or a lump sum up to any amount someone wishes. The interest earned on the bond is added to the capital and both are realised on death when it may be paid to the funeral director to cover expenses. Prepaid funerals are different in that there is a contract between the individual and a funeral director. The choices made — such as the type of service, the type of coffin, a minister or celebrant and cremation or burial — are paid for at today’s prices. Funeral insurance is similar to other types of insurance where you pay monthly or fortnightly premiums for a fixed amount of cover. Rather than saving for funeral costs, you are buying insurance to meet those costs at some future date. 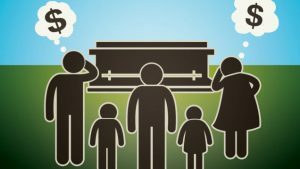 Depending on when you die, you could end up paying insurance premiums for years and possibly well in excess of the actual cost of your funeral. Prepaid funerals and funeral bonds of up to $12,500 for an individual have the added benefit of being exempt assets under the Centrelink and Department of Veterans Affairs means test for the age pension. A burial plot is not included in your assessable assets, regardless of its value. Bina Brown is a director of aged care services company Third Age Matters.